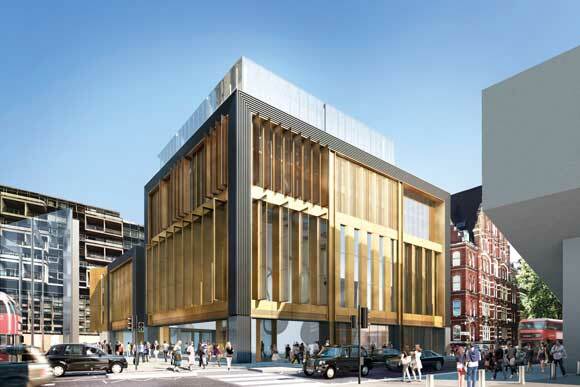 A central London mixed-use development that contains an urban gallery and a basement auditorium is being constructed around a number of site constraints including a nearby Underground escalator shaft and a Crossrail tunnel. Martin Cooper reports from St Giles Circus. Steel tonnage: 2,400tSituated alongside London’s Denmark Street, a thoroughfare steeped in musical heritage, and also known as Tin Pan Alley, the St Giles Circus development is a mixed-use scheme that features, among other things, a large urban gallery which is said to re-imagine a music venue for the 21st Century. Housed in a large column-free ground floor space, which is four-storeys high, the gallery will feature two innovative, retractable façades which when open reveal LED screens along two walls as well as the ceiling. “The urban gallery is the face of the project. It is a multi-functional space for different types of events. The concept is built on the musical and creative past of Denmark Street and provides a venue relevant for the 21st Century,” says Orms Project Architect and Associate, Andrew McEwan. 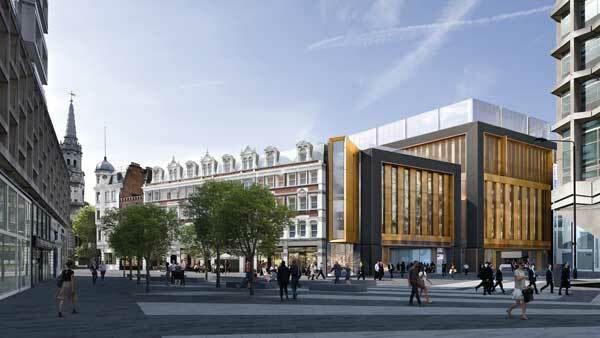 The gallery is just one part of the overall development as the St Giles Circus scheme consists of four separate new buildings (A, B, C and D) that also house an hotel, retail spaces, commercial offices, restaurants and bars, and residential accommodation. 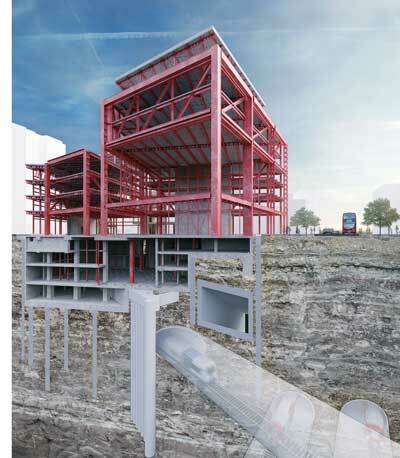 Meanwhile, below ground there is a four-storey deep basement, which will house a box-within-a-box 2,000-capacity acoustically isolated auditorium as well as offices and back-of-house facilities. A series of steel plunge columns has been installed, some within metres of the Crossrail Elizabeth Line tunnel that is located under the site. The piles have allowed the basement excavation to begin and then the ground floor transfer slab to be cast. 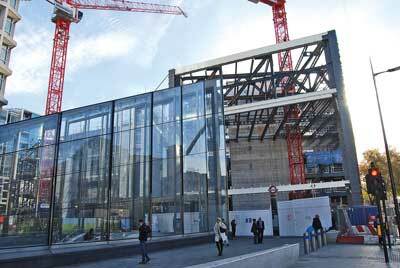 To form the ground floor, four steel transfer beams, up to 33m long, were installed and then cast into the slab to help bridge over the basement auditorium, which is a large column-free space. With the slab completed, the above ground steel erection was able to begin with the project’s largest structure. This is the seven-storey high Building A, which has some long spans to accommodate the urban gallery. These are up to 24m-long and could only have been efficiently created with a steel solution. Erecting and designing this structure has been anything but straightforward, with one of the biggest challenges involving the position of the new escalator shaft for Tottenham Court Road tube station. One of Building A’s columns in the north-west corner sits directly above this shaft and so foundations were out of the question and consequently it is hung from cantilevering steelwork. Some large beams in the gallery, up to 34t in weight, connect to this hanging column and transfer the loads from above onto adjacent columns. “These beams are very large because they also support the 24 moveable louvres that weigh four tonnes each. Consequently, there are some considerable loads being transferred to the box section columns,” says Engenuiti Associate Ian Hamilton. All of the gallery’s columns are fabricated plated box sections, with the largest measuring 1,650mm × 400mm. Meanwhile, a series of three 24m-long three-storey high trusses forms the lid to the gallery, with parts of the building’s upper floors accommodated within their depth. The gallery fills roughly two-thirds of Building A’s footprint, with a smaller area to the south formed in a traditional beam and column configuration around a central core. The rear part of the building, as well as part of the top three floors, will accommodate the hotel, alongside offices, conference spaces and a top floor restaurant. A considerable amount of temporary works has also been needed during the erection of the adjacent five-storey Building B, which is similar in design to its sister structure, insofar that it also has a ground floor open space for events. “While the excavation of the basement was ongoing we had to install a series of large temporary beams to spread the steel frame’s loads and span over areas where the permanent works below ground were not complete,” explains Severfield Senior Project Manager Michael Bryars. 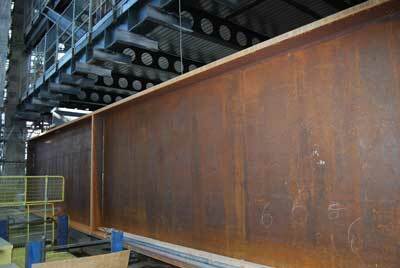 The ground beams are very large, with each one measuring 18m-long × 2.2m-high and weighing 15t each. 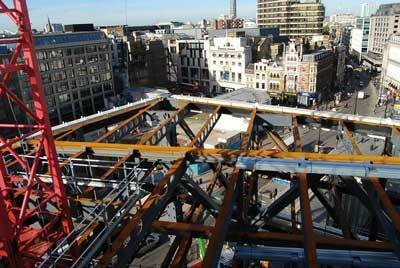 Because of the top-down construction programme, the steelwork has been split into two phases, with the initial part involving the erection of buildings A and B. This work was completed at the end of last year (2018) and a second phase of basement steelwork will begin in March (2019). “This part of the project will be like building a ship in a bottle, as the steelwork for the auditorium will be lifted into the basement through a 7m × 4m opening in the ground floor slab,” says Mr McEwan. The steelwork for the basement auditorium’s roof, which measures 28m × 24m, will be built at low level in the basement and then jacked up to the underside of the ground floor slab using 16 hollow ram jacks located above the slab. While still being held by the jacks, the acoustically and dynamically isolated auditorium’s remaining steelwork will then be erected before the jacks are removed via the same access void in the slab. The project’s two remaining structures, C and D, are smaller concrete-framed buildings, both featuring steel-framed top floor plant decks. Building D adjoins Building B and shares a retained façade along the St Giles High Street elevation. The St Giles Circus development is due to complete in 2020. The street that is still synonymous with music publishers, music industry magazines and recording studios will be partially refurbished as part of the project’s phase two. Skanska will refurbish some of the buildings along the north side of Denmark Street, with many independent music shops having their premises updated with offices and residential accommodation on the upper levels. The works also cover a number of Grade II listed buildings on Denmark Street, Denmark Place and St Giles High Street (pictured above), some dating back to before the Great Fire of London in 1666. The ‘smithy’, a 300-year-old structure that has been a stable yard and a blacksmith, has been placed on a concrete raft and moved temporarily within the site, before being returned to its original location to become part of a new grassroots music venue. The use of plunge piles at St Giles Circus facilitated simultaneous progress on the superstructure and substructure, which has benefits for the overall construction programme. Plunge piles are bored piles, with a steel liner to at least the upper length. After reinforcing the pile bore with a prefabricated cage and pouring concrete, a steel section is lowered into the wet concrete. Key to this process is the final position of the steel section on plan, to the correct level and vertical alignment, as the superstructure steelwork will be located directly on the tops of the steel sections. The positional tolerance for bored piles is generally specified as 75 mm in any direction at the level the boring commences (note that BS EN 1536 specifies a more generous minimum tolerance of 100 mm for small piles and a tolerance of 150 mm for bored piles over 1.5 m diameter), which is incompatible with the accuracy of the superstructure steelwork. To ensure accurate placing of the steel section, contractors have developed temporary guide frames that are located within the upper length of the pile casing (concrete is not placed in this upper length of the pile). These frames adjust to suit the size of the steel section, and usually have hydraulic jacks to align the steel section to a high degree of precision. The steel section is then lowered through the guide frame into the concrete, held in position whilst the concrete cures and the guide frame subsequently removed. The plunge column may have a removable top extension with side brackets to assist in the adjustment and maintenance of the vertical position. Typical tolerances of the steel section within the plunge pile are ±10 mm on plan and level, which is satisfactory for subsequent erection of the steel superstructure. Tolerance of 1:400 might be allowed for in design, but practice is often much more precise: an average verticality of 1:3000 has been achieved on some sites. The load transfer between the steel section and the concrete pile is usually based on the surface area of the steel section in contact with the concrete, to calculate an appropriate embedment length. There does not appear to be any codified guidance on what bond strength should be taken, so designers and contractors have their own approaches to this calculation, supported by test.